Our first stop was at the Applegate Lodge in Applegate, Oregon, which was a great first show because we had played there several times before and I really enjoy the community of people there; I consider many of the people there good friends! 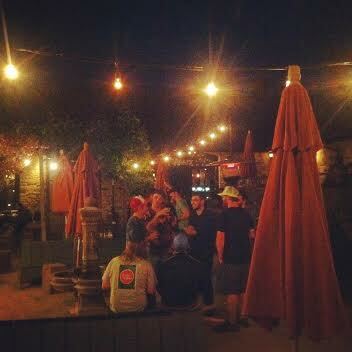 After that we headed down to the Hopmonk, a venue in Sebastopol, California. The space was designed to look like a medieval abbey, with a courtyard and stone buildings, really cool. It was also a nice birthday show for Jason! The next night we played in South Lake Tahoe, at a new venue called the Loft. The opening band, 4 Piece Puzzle, will be down in New Orleans for Jazzfest too, so it was nice to hang out with them before then. Saturday night was the Boom Boom Room in San Francisco. Kate and Naomi of the band Syrinx Effect were in town that night as well, but unfortunately the timing didin’t work out to hang before the show. More often than I’d like I find myself scrambling to find time to catch or meet up with friends while I’m on tour; sometimes soundcheck takes longer than expected, or we have to leave right after we play, or we have to be at the venue early, etc. I did get a chance to meet up with my friend Jack, and I finally was able to meet his fiance Diana too, which was really fun! By the end of the first week, I found myself thinking a lot about the different music I play and what it takes to find the people that like it. It has been really inspiring to play for really supportive audiences, and I hope to come home motivated to compose, practice, and work on my sound and approach. I’ll stop here for now, but next post I’ll pick up with week 2, some considerations about the non-music aspects of my life, and more random tour thoughts! Tour was cancelled. Time to come back. Nice to find your blog! Go ahead and mess with Texas, and extend my best wishes to the rest of the Polys!